March’s birthstone is aquamarine and many of our clients are looking for beautiful pieces manufactured with aquamarine. I have noticed in the industry, jewelers only manufacture inexpensive or ugly pieces of jewelry using aquamarine because the stone is not that expensive compared to other colored stones, such sapphire or ruby. 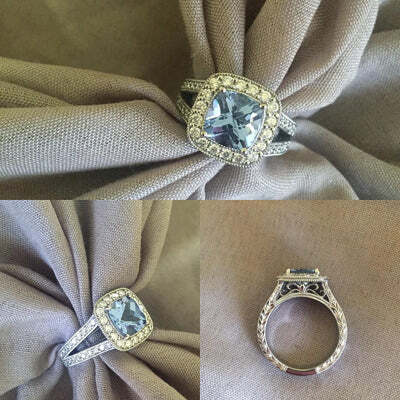 At deBebians we use the finest diamonds and the highest quality aquamarines we can get our hands on. This is what sets us apart from other companies. Below, you will find a few beautiful pieces we have manufactured and can manufacture for you. 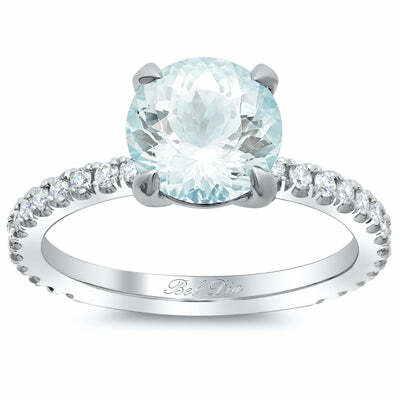 Below, you will find a custom aquamarine engagement ring with a 7.9mm x 7.9mm cushion cut stone. This aquamarine was re-cut by our stone cutter for additional facets on the top of the stone, therefore creating more sparkle. The ring was based off of style number HE136, which is our cushion halo engagement ring with split shank. The customer also wanted a custom engraving based on style number HE135. I love the contrast of the hand engraving and the custom cut aquamarine. Aquamarine rings are getting more and more popular. The ring below is one of our most popular engagement rings and we decided to place a beautiful round aqua into this setting. I always say simple is more elegant and this pieces is exactly that. Another piece we manufacture for the month of March is our aquamarine diamond station necklace. I have designed this piece in many combinations. 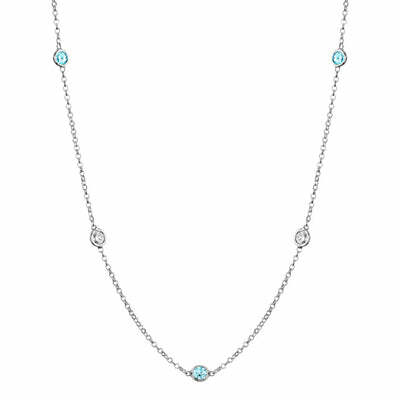 Our most popular combination is our diamond and aquamarine combination which can be seen below but, one of my favorite pieces was a custom 36” station necklace that can be worn as one long 36” necklace or doubled up (wrapped up) as 16” and a 20”. You can find a huge selection of aquamarine jewelry for the month of March by browsing our Gemstone Jewelry Guide or by contacting us to create a one of a kind work of art. Please feel free to contact us for further assistance with any aquamarine jewelry.